PRESS RELEASE: Gibson City Blues Jam is a new and exciting monthly event that puts budding musicians up on stage. 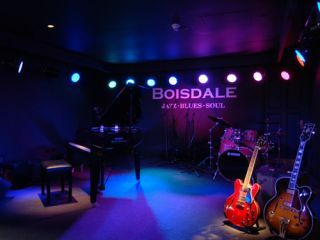 In one of the city's most impressive venues, Boisdale of Canary Wharf. Gibson City Blues Jam will provide guests with a unique opportunity to perform on stage with the Gibson City Blues Jam house band, Pacifico Blues. Dinner guests will have the opportunity to jam with Pacifico Blues using a Gibson Custom guitar in the exquisite setting of Boisdale of Canary Wharf. A selection of Gibson Custom guitars will be available for purchase on the night. Gibson City Blues Jam will invite guests to become part of the house band, be it on guitar, bass, drums, keys or vocals. Pacifico Blues will support and improvise, incorporating each participant's style and musical ability. Gibson City Blues Jam celebrates the blues, rock 'n' roll, and above all, a great night out. "It is the ultimate way to be in the band, but without the commitment." The Gibson Custom Shop in Nashville doesn't just make the world's finest and most sought after guitars, they make dreams a reality. Gibson Custom have been producing the ultimate hand crafted electric guitars since the 1920s and who hasn't dreamed of owning a similar guitar played by the masters of their craft, legends such as Jimmy Page, Jeff Beck, Slash, Eric Clapton, Angus Young, Marc Bolan, Mick Jones, Joe Bonamassa and BB King to name a few. Pacifico Blues is a contemporary London Blues outfit featuring musicians from the internationally renowned AllStars Collective; the session musicians who in their day jobs play with the world's most celebrated music artists. The Gibson City Blues Jam offers the incredible "money can't buy experience" of performing on stage with some of the music industry's elite. Former Banker and band leader Paul Pacifico said "I worked in the City for 10 years before giving it up to follow my dreams in music. It's fantastic to have the chance to come back to the City and play music with all the guys that used to be in bands but now just don't have the opportunity to play"
Go here to reserve a place at Gibson City Blues Jam. For more information on Gibson Guitar, please visit www.gibson.com.